I thought I was going to be a little "thin" on pics this week, due to lifting barges and toting bales last week, but it turns out I had to cull the shots to get the update to a manageable size. We have some interesting intakes, a nice group tour, a beautiful golden arrival, and a trip to the X-ray facility. Plus, I'll be climbing on a short soapbox, so bear with me! 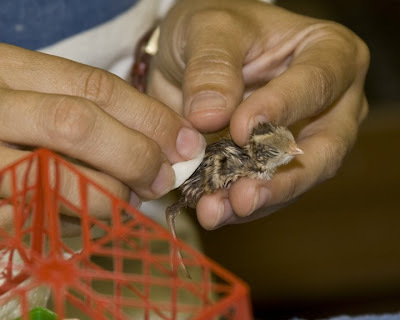 An orphan baby quail gets a sponge bath. 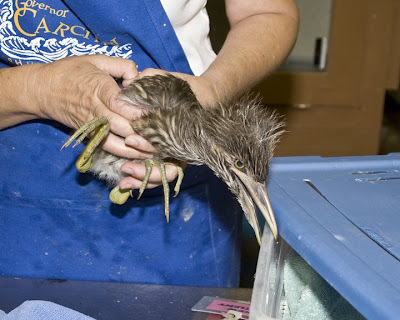 A baby black-crowned night heron got beat up by some local "bully birds". 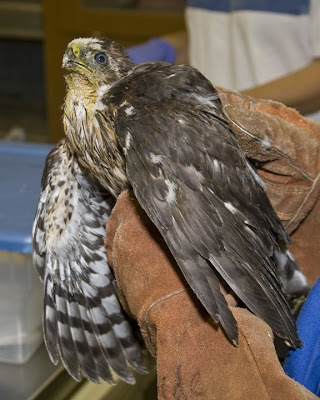 A little Cooper's hawk fights a serious case of avian canker. 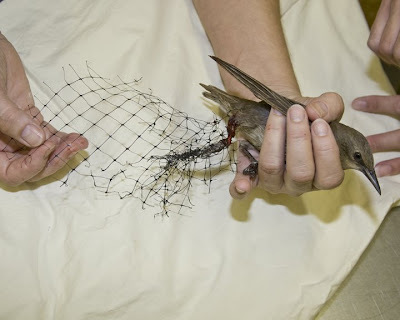 The variety of problems faced by the wildlife of Arizona poses a challenge to the staff at Liberty as they deal with injuries and illnesses of every type. From natural occurrences to direct intervention by humans, the problems must be recognized and treated properly to give the animals a chance at survival. Joe and Libby "Wow" the crowd! Sonora shows off her flying skills. A group from a local school that wants to include environmental education in their curriculum in the future came by for a tour last week. 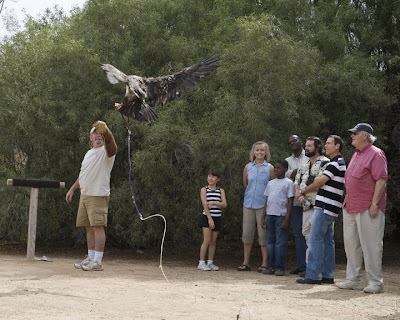 They got to see the operation in action, plus a first hand viewing of our eagles getting fed and Sonora doing her flight training. 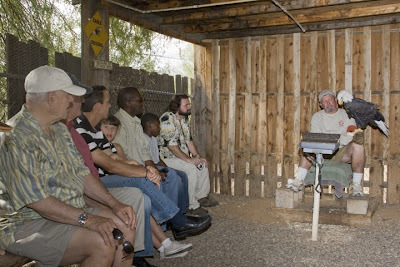 Liberty is always looking to partner with groups to further the goal of advancing the public's knowledge and appreciation of the wildlife of Arizona. Carl and Mary Price arrive with a large passenger. She's a big girl...and Lesley seems to enjoy holding her for the initial exam. Not too beat up after a long car trip. 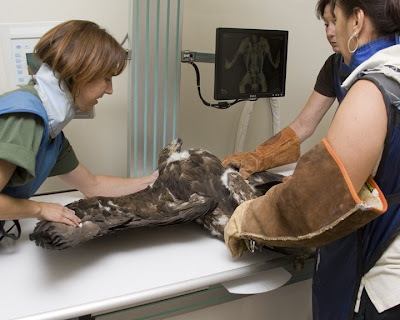 Eagles always get a blood test. Joe crates her for a short ride for X-rays. Dr.Wyman, Jan, and Joanie all are needed to hold her down. 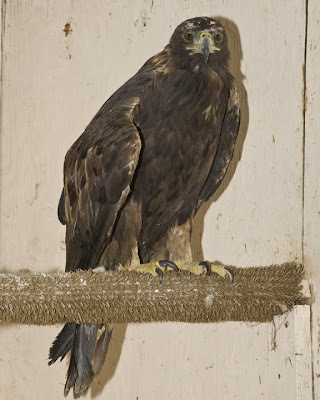 A large (probably female) golden eagle came to Liberty last Thursday. The adult bird had been in the care of the Hopis and they noticed she was not flying well. Federal and State agencies came into play and she found her way to us. The long road trip was tough on her, but she survived in mostly good shape, hungry, with a noticeable wing droop. 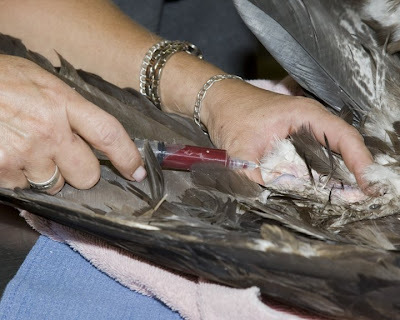 As with all eagles, her blood was drawn and sent for testing. 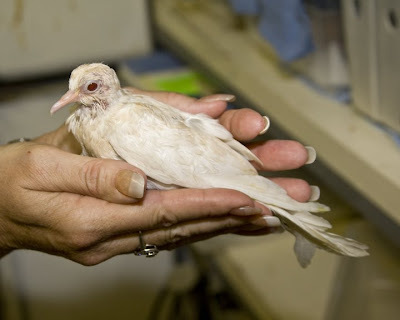 The next day, she was taken for X-rays which showed some cause for concern in one of her wing joints. Currently she is in the 60 foot flight enclosure awaiting further observation and evaluation of the test results. 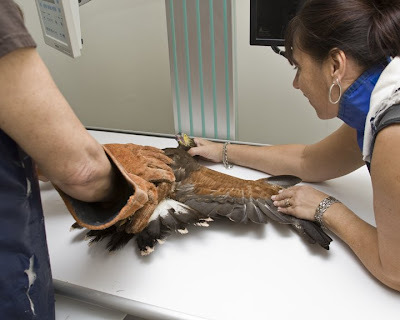 Jan positions a harris' hawk for X-rays. 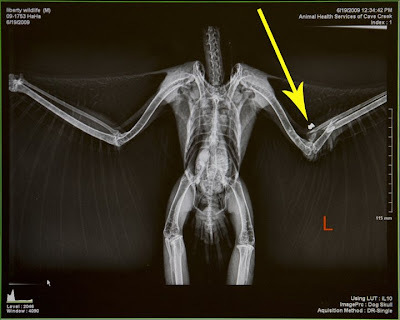 A broken wing is discovered - along with the pellet that caused it. A little starling is the victim of "Cactus protection"
It's sad when the birds get sick and injured from things that occur naturally in their environment. 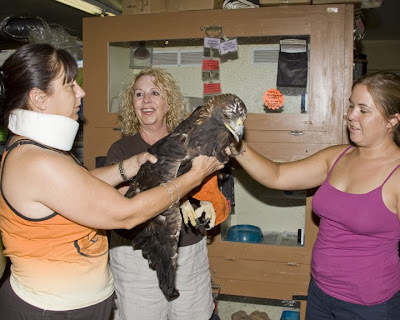 When they are injured directly from human activity, it's obvious we need to do even MORE education. 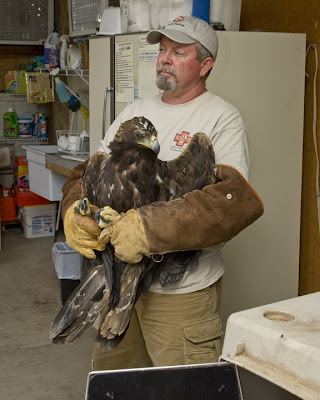 A small harris' hawk that was at Liberty with a broken wing was discovered to have been the target of someone with a pellet gun. This was not apparent in the initial exam but became obvious in the X-ray which showed the lead projectile next to the two broken bones. 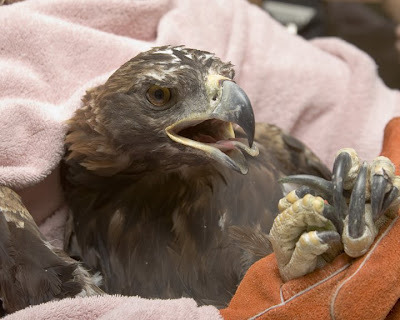 No matter if the victim is human or avian, shooting is senseless and cruel. 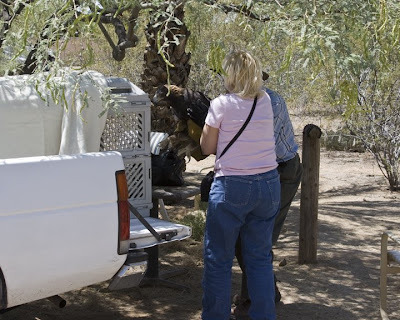 Then this morning, a little starling came in with probable life-ending injuries from some plastic netting that had been used to "protect" a cactus from - you guessed it - birds and animals, their natural neighbors. The irony is that starlings pose no hazard to cacti of any species. Trust me on this: birds are far less of a threat to desert plants than pollution or people with guns and ATVs...or plastic netting.